To activate your 25 year warranty on our BS669 Part 1 Natural Gas cooker hose, please ensure all sections are completed accurately. Subject to terms and conditions which can be seen at the bottom of this page. Batch code can be located as highlighted by the red circle in this image. 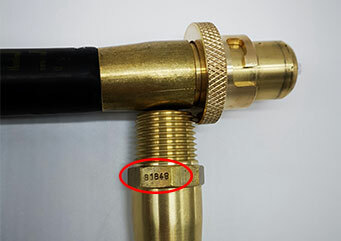 Cookerflex gas hoses have been rigorously tested to comply with BS669-1 for quality and durability, as well as being kitemarked and supported by our ISO 9001:2015 accreditation. Tesla UK Ltd are proud to offer a 25-year warranty that covers our Cookerflex hoses against manufacturers defects in materials and craftsmanship when registered on our website. The warranty for our Cookerflex range remains in force for twenty five (25) years from the registered date of install. The warranty is only valid for installations performed by a registered gas safe engineer. This warranty covers defects in material and craftsmanship on our BS669-1 hoses within our Cookerflex range, (at Tesla UK's discretion) the warranty is only honoured for each registered installation. This warranty does not cover installs performed by a non-gas safe registered engineer, non-conformities due to installation errors or installations not registered on our website. Inappropriate use, abuse, misuse, or alteration of the product will also invalidate this warranty. What will Tesla UK Ltd do in the event of a claim against the warranty? Tesla UK Ltd will examine the product and decide, at its sole discretion, if the product is covered under this warranty. If considered covered, Tesla UK Ltd will then replace the defective product with the same or a comparable product. If the defective product is covered by this warranty, Telsa UK Ltd will not pay any costs of repairs, spare parts, labour and/or travel for replacement or the product that is not authorised by Tesla UK Ltd prior. If the item is no longer sold by Tesla UK Ltd, Tesla UK Ltd will provide an appropriate replacement. It is Tesla UK Ltd that determines, at its sole discretion, what constitutes an appropriate replacement.